When my husband Bob saw this quilt taking shape, he said, "I want this one." We're "dog people", so it's staying here instead of becoming a gift or being listed in my etsy shop. We don't let our dogs "enjoy" the quilts I make. Dudley loves them so much he eats/chews them! That's a fabulous quilt and the quilting is just right. I can see why your husband claimed it. What a fun quilt. I hope Dudley doesn't decide it's his. Perfect quilting for it too. Thanks. Your quilt is adorable! No wonder your husband claimed it for himself. I love the bold graphic look and your quilting is beautiful! Great quilt. Poor Dudley can use his own bed. I can understand why your husband would want to keep this one. I love it! And I love Dudley even with his quilt eating habit. Dudley does look a little bit guilt there. Love your quilt. Great 'dog' quilt and what whimsy quilting - poor Dudley. Lovely quilt ! thanks for sharing! Wonderful quilt! love the bone quilting. Ohh Dudley quilts are for napp'n not munch'n...you are adorable anyway!! 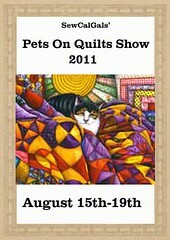 That is the cutest quilt - and I love the dog bone quilting! What a neat quilt and so great that your husband loves it! Dudley is so cute, maybe some day he won't chew on quilts. Love Love Love it. I have been reading about all you quilts but just haven't taken the time to leave a comment. You know I read all of your blogs everyday! You amaze me with ll that you do! Nice to meet you Dudley! Daddy Bob has wonderful taste in quilts. We would have kept this one, too! What a great quilt! I'm glad you kept it for your husband! Dudley is a cutie! Glad he won't get to chew on the quilt. That quilting is fabulous! I can see why your hubby wanted this one for himself! Yes! The bone quilting is wonderful. Dudley will need to guard that great quilt instead of chewing it! Wonderful quilt! I can see why you kept it. Dudley thinks it is good enough to eat! The quilting you did on this is the perfect design for this quilt. I would not call this humble, I think it is awesome! I think Bob made a good decision when he claimed that quilt. It's fun to look at and beautifully made. And Dudley is adorable. Your dog quilt is so pretty and your dog is adorable. Your quilt and Dudley are adorables!! that is the cutest quilt ever. So is Dudley. He would love to have some fun with that quilt! Oh, I didn't notice the dog bone quilting until Bonnie pointed it out! It's a fantastic quilt. Too bad Dudley likes to chew them! Your quilt is gorgeous, and Dudley is quite a charmer! Your quilting is perfect on this quilt. I love the little bones. How cute of your DH to lay claim on a quilt. Nice work, I love the quilting on it. Maybe Dudley needs his own quilt. Or not. It would be a shame to see your beautiful work chewed up. Very creative way to use that doggie fabric! Great quilt! Too bad Dudley has to sleep on the rocks.